Significant Icing Event Possible for Central U.S.
Home » Featured » Significant Icing Event Possible for Central U.S.
Ice Storm Warnings have been expanded to include much of Kansas and north central Oklahoma. Areas under this Warning in east central Kansas, including Salina, could get up to an inch of ice accumulation through Sunday. An Ice Storm Warning has been issued for most of Missouri and parts of southwest/south central Illinois. This Warning will begin Friday morning and last through Sunday night. Over this multi-day period, one quarter of an inch to three quarters of an inch of ice are possible. Isolated locations could pick up closer to one inch of ice accumulation. Main concerns with this event continue to be dangerous road conditions and power outages. A strong storm system will move through parts of the Plains and Midwest over the next few days and could produce significant ice. 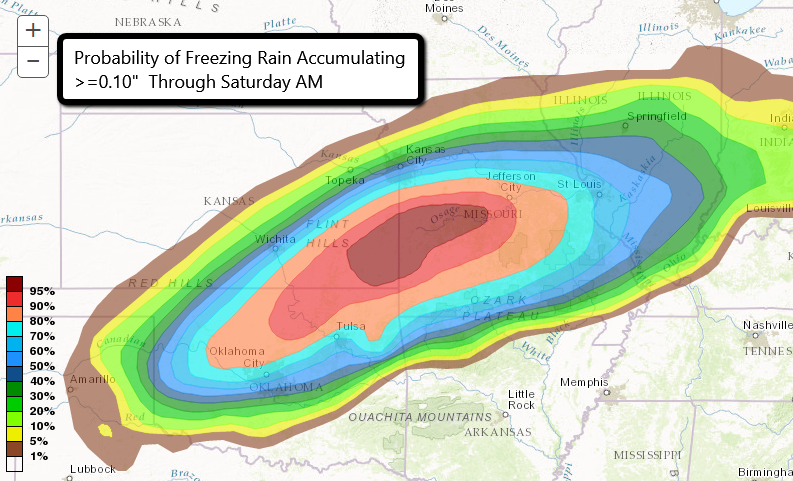 A layer of warm air above sub-freezing surface temperatures will lead to widespread freezing rain from the Texas panhandle to central Illinois. A Winter Storm Watch has been issued for these locations until Sunday. 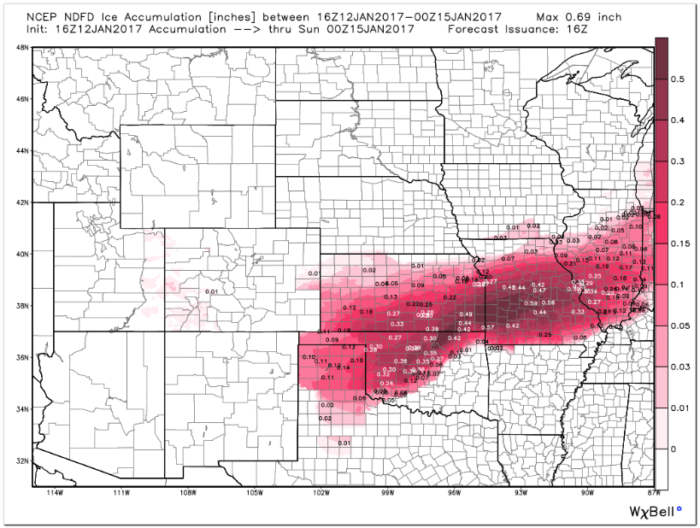 The highest ice totals right now look to stretch from north central Oklahoma through southeastern Kansas and into much of central Missouri. This includes Wichita and Emporia, KS and Kansas City and Columbia, MO. These spots could pick up anywhere from a quarter inch to three quarters of an inch of ice through the weekend. Very dangerous driving conditions are expected across the Watch area. Even if roads are pre-treated, ice will accumulate quickly. It is recommended to stay home if you can! Power outages and downed tree limbs will also be possible.